There is no fee for registering for this event. You will have to pay a $50 orientation fee at the orientation. All urban deer hunts will open Saturday, Sept. 1, 2018 and close Thursday, Feb. 28, 2019. Check your city protocol as they can set the dates to start later or close earlier then other cities. The following cities will host urban archery hunts in the 2018-19 season: These maps will be updated as we get the new maps from the cities. NOTICE: Hot Spring Village is limited to 200 permits. Registration for Hot Spring Village is open. Any unused permits will be available on a first come first served basis at the end of the Hot Springs Village Orientation on Aug 11, 2018 . A drawing will not be conducted for these hunts. 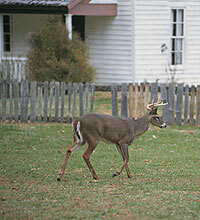 However, all hunters are required to follow the protocol outlined in the following document. For a complete list of ABA help classes check out our web page. If you prefer to take the online class you can follow this link. But you will still have to attend the Field Day portion of the ABA class. You will need to take the online class. You will still need to attend one of the field day classes held at the one of the orientation. If you have attended one of the classes in the past and already received your Bow Hunter Ed card, you will not need to attend the classes again.